^ 4.0 4.1 Bamford, Samuel. Passages in the Life of a Radical. 1843. ^ Institution of the Working Classes. UCL Bloomsbury Project. University College London. [28 August 2012]. ^ Beer, M. A History of British Socialism. London: G. Bell & Son. 1921. ^ F.C.Mather. The General Strike of 1842: A Study in Leadership, Organisation and the Threat of Revolution during the Plug Plot Disturbance. web.bham.ac.uk/1848. George Allen & Unwin Ltd London. 1974 [30 January 2008]. ^ What do we mean by a General Strike?. ^ Carl Strikwerda. A house divided: Catholics, Socialists, and Flemish nationalists in nineteenth-century Belgium. Rowman & Littlefield. 1997: 109 [23 September 2010]. ISBN 978-0-8476-8527-1. ^ Carl E. Schorske. 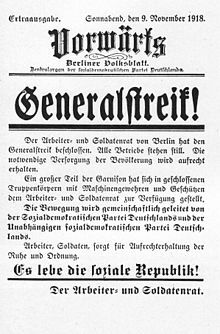 German social democracy, 1905-1917: the development of the great schism. Harvard University Press. 1983: 34 [23 September 2010]. ISBN 978-0-674-35125-7. ^ Luxemburg, Rosa. 三论比利时的实验. [2018-02-21]. ^ Labour research - Labour Research Department, Fabian Research Department - Google Books. Books.google.com. [15 August 2012]. ^ Bill Haywood, The General Strike (Chicago, n.d.), pamphlet, published by Industrial Workers of the World, from a New York City speech delivered March 16, 1911. ^ Ken Knabb. The Beginning of an Era. 情境主义国际期刊. 1969年9月, 12 [2019-01-03]. ^ Raymond Léger. October 14, 1976 - The Saint John General Strike. wfhathewaylabourexhibitcentre.ca. Hatheway Labour Exhibit Center. [2019-01-03].